These are resources we feel can be most helpful. Click one to see to what is helpful to you. THE JEWS OF BROWARD COUNTY, FLORIDA Historical research compiled by Bernard Israelite Kouchel initially in 1991-1992 when he chaired the Broward County Research Committee for "MOSAIC: Jewish Life in Florida," the organization that is now the Jewish Museum of Florida. This timeline begins with some of the formative events in Florida history and then focuses on the story of Broward's Jewish history, from early settlers to people who are an integral part of the county's culture and commerce today. It is dedicated to the pioneers who shaped the communities in which we live today. Tracing one's ancestry, known as genealogy, has become a popular activity in the U.S. In previous decades, it was somewhat difficult to conduct efficient research. Today, however, online resources help to make this task much easier and informative. It helps to compile an outline of what you already know so far and be further supplemented by interviewing family members about vital data and lives of relatives. All of this information can form a valuable base when you begin your hunt. Remember to stay as organized as possible, since genealogy tends to involve very large amounts of data, images, and files. Helps turn those "aged 58 yrs, 3 mos, 5 days" tombstone inscriptions into dates. The following is GenealogyInTime Magazine's global list of the Top 100 Most Popular Genealogy Websites as of January 2015. The Federation of Genealogical Societies links the genealogical community by: serving the needs of its member societies, providing products and services needed by member societies and marshaling the resources of its member organizations FGS was founded in 1976 and represents the members of hundreds of genealogical societies. 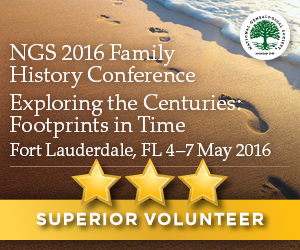 FGS links the genealogical community by helping genealogical societies strengthen and grow. To do this, FGS publishes FORUM magazine, filled with articles pertaining to society management and genealogical news. FGS also publishes an extensive series of Society Strategy Papers, covering topics about effectively operating a genealogical society. FGS also links the genealogical community through its annual conference -- four days of excellent lectures, including one full day devoted to society management topics. This links those users who want direct access to individual state and territory information. To use this valuable tool, you must first determine the state or area where the birth, death, marriage, or divorce occurred, then click on that state or area. Please follow the provided guidelines to ensure an accurate response to your request. The federal government does not distribute certificates, files, or indexes with identifying information for vital records. This service calculates the duration, counting the day count and the number of days, months and years between two dates. Among other things, it can be used find how many days old you are and the weekday you were born. It also enables you to add or subtract days, months and years to a date to calculate a past or future date. We are the oldest genealogical society in Florida, founded in 1958. Our meetings are normally held at 10:30 AM on the first Saturday of the month at the John F. Germany Library, 900 North Ashley Drive, in downtown Tampa. However, our annual Fall Seminar is traditionally held on another Saturday in September at another location. The Florida State Genealogical Society was founded to promote the study and research of genealogy and local history. The society publishes source materials and family history, while encouraging seminars, workshops and similar educational meetings in the State of Florida. All genealogy societies in the State of Florida are members of FSGS at no charge. The General Land Office - Eastern States Office (GLO) is the custodian of millions of title documents, maintaining and protecting the Secretary of the Interior's official copies of over 9 million GLO records. These records are considered vital to the core responsibilities of the Bureau of Land Management (BLM). Some of these records date from the late 1700's. A database of 6.3 million names of soldiers from both sides. Names are linked to regimental histories and short histories of battles. The official website of the Charlotte County Genealogical Society, Inc., a non-profit corporation serving Charlotte County in Southwest Florida since 1976. Their mission is to assist and educate their members and their community in their quest for genealogical and historical information. Find the graves of ancestors, create virtual memorials, add 'virtual flowers' and a note to a loved one's grave, etc. Also see the graves of thousands of famous people from around the world. Interment.net is a publisher of cemetery transcriptions for use by genealogists and local historians. Visitors use our online library to help them locate burials of their family and friends, trace their family history, and learn something about cemeteries in general. Some sites herein are fee based. Lee County Genealogical Society is dedicated to collecting, preserving and perpetuating the genealogical and historical records of our ancestors; and to encouraging and aiding individuals in their family search.